My nephew LOVES this verse. It’s one I’ve been teaching him. We’ll be looking outside or playing outside and the trees will be swaying back and forth and he’ll SCREAM “trees clapping their hands!!! !” (he’s only 2 years old) and I’ll say, “that’s right Aidan, and who are they clapping their hands for?” His reply has got to be sweetness to the ears of my Savior, because Aidan will scream at the top of his lungs “JESUS!!!!!!!!!!!!!!!! !” (he kind of shrieks at the end). Yes, Aidan – they are clapping and praising the name of my sweet sweet Jesus. Aidan doesn’t even realize that he has just joined in with their praise. How precious to hear the name of Jesus come so joyfully off the lips of a 2 year old. May that Name always come off Aidan’s lips in praise. May he take that Name to the nations one day and make His Name famous. Here is a strange painting of some trees. It’s a different technique I was playing around with one day. I love how the colors turned out. I have another one like it I’ll post soon. Yes – God would HAVE to love Aidan’s screaming! 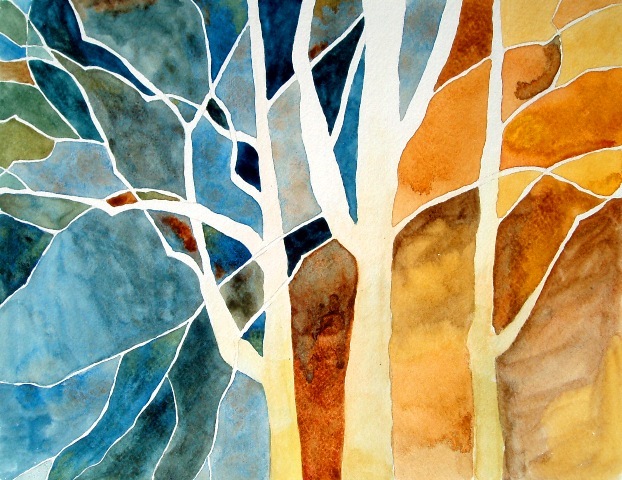 Thanks for such a sweet posting – and I love the technique you used with painting these trees. Mary Lee, thank you for the very kind comments! Susan has spoken often of you and has told me about Ryan and his struggle. I love your ideas – if any of them make it to a finished painting I will contact you. I LOVE the idea about the fiery furnace with Shadrach, Meschach, and Abednego. I’ve already started rolling ideas through my head – however, that doesn’t mean it will turn out on paper like it is in my head – I’m never quite sure what will turn out and what won’t. I have definitely been inspired! I promise if any of these come out presentable I’ll get in touch with you. Thank you again for the kind words! I hope we get to meet at church face to face – I’ll have to tell Susan to introduce us! Mary Lee, I’ve actually come up with some sketches, but nothing that actually works yet – I’m still playing around with it – we’ll see what happens. You’re right – if it’s meant to be the Lord will show me what it’s to look like. I’m usually just as surprise when a painting turns out as anyone – the gift is definitely from the Lord – no skill here! I’ll let you know if anything turns out. I’m glad you sent another comment, because with the trip I forgot about the sketches I made – I’ll have to get those back out and work some more on them! We talk about moving out west all the time too – we LOVE it out there. We go skiing a couple times a year out there. It was beautiful this time of year! You paint like I draw. I love to focus on the shapes created by the shadows and lighting. This picture is very cool!